The holidays are upon us again! There’s snow on the ground and lights are hung, so we should all be feeling the spirit of the season by now. But if you still need a bit of a kick-start to get in the festive mood, or you’re just looking for more ways to soak in the magic of the season, Denver has plenty of events and activities to celebrate this special time of year. Downtown Denver helps you officially kick off the holiday season with the annual 9News Parade of Lights, December 4th -5th. Brisk December air does nothing to dampen the enthusiasm of the thousands who attend this colorful event to watch marching bands, dancers and light-covered floats meander their way through the streets of downtown. 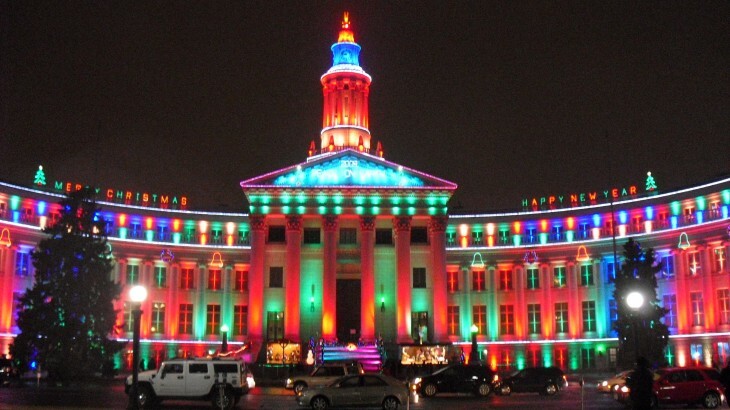 The parade starts at 8 p.m. at the spectacularly lit City & County Building. Starting November 27th and running through January, the Denver Botanical Gardens lights up its gardens and trails with the Blossoms of Light event. Thousands of twinkling, colorful lights adorn the flowers, trees and trails of the gardens, creating a enchanted display. Warm drinks are available to keep you toasty as you take it all in. Get in the Christmas spirit with this annual, German-themed holiday market, open daily from November 20th through December 23rd. Sip on German beer or warm spiced wine as you stroll the Christkindle Market and shop local artists, enjoy singers and live shows, or stop for a bite of authentic German food from the many vendors. Lace up your skates and hit the ice at one of two unique skating venues in the Denver area. City dwellers can skate for free (or rent skates for $2) at the very urban Skyline Park, located conveniently in the center of downtown Denver at 16th and Arapahoe Street. Nature lovers who prefer the feeling of skating at a mountain lodge in the woods can head to scenic Evergreen, just 20 minutes outside of Denver. Evergreen Lake House opens mid-December for skating and offers a beautiful, green escape from the city that is guaranteed to give you that warm, holiday feeling. The Denver Zoo comes to life every night of the season, starting December 4th, when holiday lights and illuminated, animal-themed sculptures brighten 70 acres of the park grounds during Zoo Lights 2015. Among the light displays, you’ll also find animal encounters, Santa Clause and nightly entertainment. Denver is the perfect place to experience the holidays, so grab some friends and get in the holiday spirit with one of these fun and festive events around Denver. esl-blog English Learning, holidays in the usa, learn English in the US, things to do in denver. permalink. Make Your Transition to a U.S. University Easy: Start at BridgePathways in Denver!